It’s no secret that I love lifting heavy weights. Strength training can be so intimidating for women but there are so many benefits from it. That’s another blog post though. Today I knew I needed to get my heart rate up and keep it up. 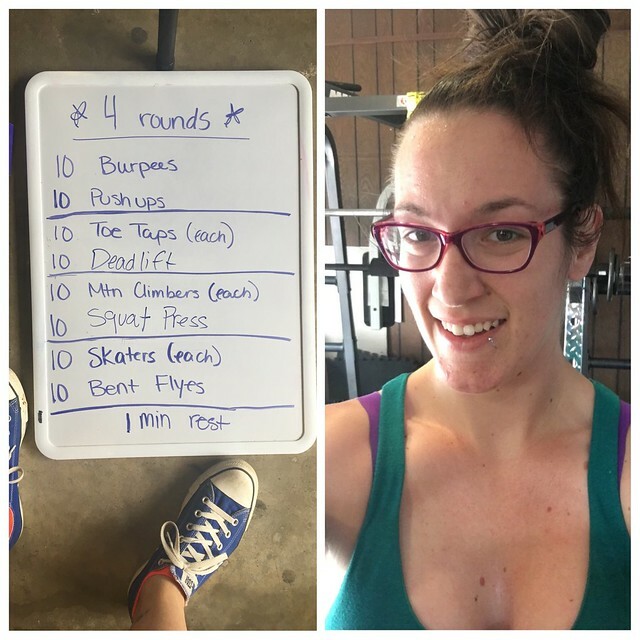 Since I really don’t enjoy traditional cardio (#notarunner) I went for a full body circuit workout. Strength and cardio rolled into one 30 minute package. And no matter how much you love the heavy lifting, changing up your workouts is always a good thing. Days like today start with the white board. 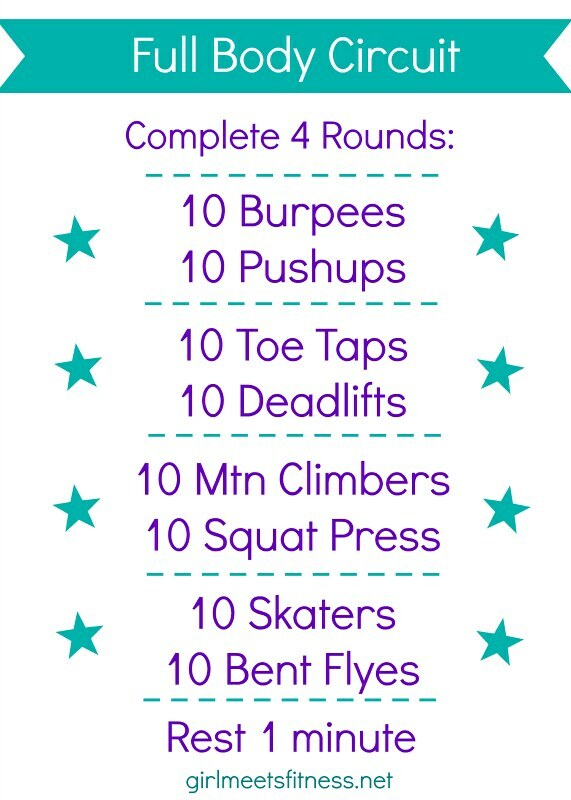 I’ll throw out a number of rounds then work down the list trying to add in a mix of ‘cardio’ type moves like toe taps, burpees, and mountain climbers with more strength based exercises like squat presses or push ups. Then I do the full body circuit, which usually results in me changing up the order until I find what I think is the best for y’all to do too. Then I come in and make it all pretty for y’all to save or print so it’s easier to pull up and follow at home when you do it! For this one you will need a set or 2 of dumbbells probably between 5-15 lbs. *Burpees: Stand tall with arms up, squat down and put your hands on the ground, jump your feet out behind you into push up position (do a push up if you want, don’t if you can’t), then jump feet back in, and jump back up to standing. Repeat. If you can’t do all that jumping then just squat down, step out into push up position, step back in, stand up as quickly as you can. *Pushups: Do these regular, on your knees, or with your hands on a table/bench. Or make it harder by putting your feet on a bench and keeping your hands on the ground. Just do them how ever it is you can. *Toe Taps: Against a step, alternate tapping your feet to the edge of the step quickly. Almost like doing high knees, which you can also do if you don’t have a step or low chair to tap on. *Romanian Deadlifts: Holding your dumbbells straight down in front of you, hinge your hips and bend forward. Keep your legs straight but don’t lock your knees. Keep your back flat and your chest up. Then stand back up straight squeezing your glutes. *Mountain Climbers: Get in push up position and ‘run’ your legs bringing your knee to opposite elbow. Do 10 on each leg or 20 total. *Squat Press: Stand, holding dumbbells, with your elbows bent and dumbbells close to your shoulders. Sit back down into a squat making sure your knees don’t fall forward over your toes. Keep your body weight in your heels. When you stand up, extend your arms up into an overhead shoulder press. Then bring them back down to start. *Skaters: Speed skaters…hop from your right leg to your left bringing the right back behind the left (keeping weight on the left), then hop from the left leg over to the right. For more challenge reach down and touch the foot you’re landing on. If you need it a little easier, take out the hop and just quickly step side to side. *Bent Reverse Flyes: Stand with your knees slightly bent and hips hinged about 45*. Hold your dumbbells straight out in front of your torso, palms facing into each other. Keeping elbows slightly bent open your arms straight out to the side then bring them back in to starting position. Run through the list of exercises doing 10 each (Toe Taps, Mountain Climbers, and Skaters are all 10 each leg – 20 total) then rest for 1 minute. If you need to take a few breathers during the circuit you can! Just don’t sit around too long. You want your heart rate to stay up. If you need a little more than a minute between rounds, take the time. Go again when you’ve caught your breath and can start your next round. And have fun!